I’ve previously written about how the NCAA and Big Ten requested to participate in Penn State’s investigation into how it handled allegations of child sexual abuse. However, none of the letters indicated whether their request was granted or not. Yesterday I came across a statement by a university attorney who said Freeh provided regular updates to at least one of the athletics governing bodies. I was told that the NCAA was getting reports from the Freeh group or at least relating to their investigation every two weeks, so we know that the NCAA wasn’t just firing up after the Freeh report was issued. Unfortunately, a lot of us missed that nugget at the time. But it’s clear that Penn State allowed Freeh’s crew to feed whatever it wanted to the NCAA every two weeks for nearly 7 months. 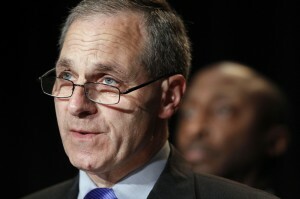 Now we need to find out what Freeh was telling them. As this appears to be true, it is absolutely another bone-headed decision/move from the BoT. Unless of course, it was choreographed. I lean toward choreographed. A management neophyte would not allow this to happen, so something remains stinky.